Once again, I was grateful to be a part of the Paideia College Society‘s annual conference at Dallas Baptist University! And now, after a bit of time off, I’m here to tell you all about it! If you’ve been following the saga of my ongoing journey through the Undiscovered Country of Star Trek, you may vaguely recall that my first paper on the topic was debuted at this conference in 2010. 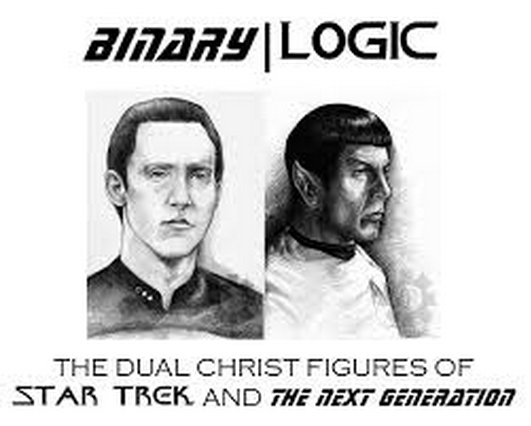 In celebration of that paper’s soon-coming publication and in the interest of deepening my quest, I made a presentation entitled “Binary|Logic: The Dual Christ Figures of Star Trek and The Next Generation” at this year’s event. I was happily surprised by the number of enthusiastic Trekkers who came to hear the talk, especially in light if the fact that this was Paideia’s heaviest conference schedule ever! It was an amazing conference. I’ve been attending these since 2003 and presenting since 2004 and this may have been the best yet. As I unspooled my yarn about Spock and Data as Christ figures, the room was filled with enthusiasm. It’s a fun subject to unpack for people and seeing everyone’s surprise at some of the things I’ve uncovered was priceless! How was my thesis received? In brief, Leigh threw her pen at me. That’s right, my dear friend and colleague Leigh Hickman threw her pen. At me. Intentionally. And I thought she sat on the front row just ’cause she loves me. NO! It was so she could attack!! In all sincerity, knowing Leigh as I do, it was a sign of love, approval and true intellectual stimulation. I took it as one of the greatest compliments I have ever received for one of my presentations. It was truly a moment. And now, because I know you’re dying to see them, here are some awful photos of me at the conference! Pay no attention to the empty chairs! The place was packed. PACKED, I tell you!! There’s Leigh on the left, ready to strike! I look very intense about something here. Yes, I wore themed garb. Yes, that is a TNG comm badge. Yes, it makes the chirping sound when you press it. No, you cannot borrow it. From left to right, my Paideia colleagues and friends: Leigh Hickman, Brandt Boehne and Natalie Stilwell. Here I am showing off my comm badge to Ol’ Pen Thrower. Or trying to. It wouldn’t chirp the whole day. Performance anxiety, I suppose. Here’s the Paideia 2011 Group Photo. It’s really just the few of us who hung around until the very end. Up front in the denim shirt is keynote speaker Byron Borger. To the left of him, my mentor and friend and Paideia’s daddy, Dr. David Naugle. Beside him is his wife, the tireless and inimitable momma of Paideia, Dr. Deemie Naugle. The rest of us hooligans are in the back. All told, this was a wonderful conference – full of papers on faerie stories, Bruce Springsteen, Catholic views of morality, Bob Dylan, literature, philosophy and so much more. I am always honoured to be a part of this event and to be counted among such wonderful scholars as it annually attracts. I’m already looking forward to next year.Pietas et Doctrina and Tolle Lege, Tolle Lege!